﻿ Classic Radio Store- Hundreds of Classic Radio Downloads! This website features thousands of old-time radio shows, digitally-remastered for superior sound quality. All your favorites from the golden age of radio can be digitally downloaded at this website. We are always adding shows so check back often. Just click on your favorite old-time radio series (listed in alphabetical order) to see what episodes are available from that series. 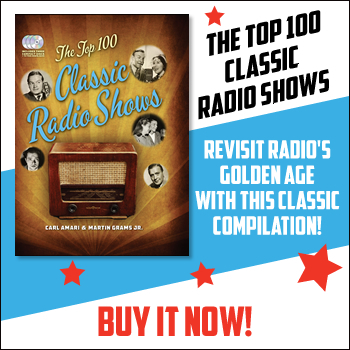 The classic radio shows are grouped in 6-hour collections of 12 half-hour episodes or 6 hour-long episodes for only $19.99. That’s only $1.66 per 30-minute classic radio show. And you’ll instantly receive the files at the time of purchase so you can begin collecting and listening to them immediately. This website is owned and operated by 30-year broadcast historian, Carl Amari. Amari has spent decades licensing and preserving classic radio broadcasts from the 1930’s, 40’s and 50’s. Amari has a library of 100,000+ classic radio shows. The bulk of his classic radio library have been transferred from the original 16 inch transcription disc master recordings. Each of the collections offered on this website have been transferred from master recordings and digitally remastered for superior sound quality. They are uncut and unedited and are delivered to you as they were originally broadcast, including the classic commercials. Amari is the producer/host of two classic radio shows: Hollywood 360 and The WGN Radio Theatre. He is also the producer of The Twilight Zone Radio Dramas hosted by Stacy Keach and featuring Hollywood celebrities in fully-dramatized radio adaptations of Rod Serling’s landmark TV series. If you have questions, comments or would like to drop us a line, please email us at camari@blackeyeent.com.